Are you looking for an elegant look and feel to enhance your guests’ experience? While Leather Menu Covers are not right for every client, they do offer a certain style that makes quite a bold statement to your overall branding motif. What is the decor style and colors? How will the menus be stored? Are you familiar with Capital Grille? Every detail is painstakingly developed to ensure the guest has an unforgettable experience. When we sat down with their team, we listened intently on his/her vision for their menu. They knew, as we did, that a menu is not just a simple delivery vehicle of the days dishes. It’s a physical representation of what the experience will be. Many guests, once handed the menu, will gently glide their fingers across the handsomely debossed logo and leather surface. As to say, “Yes, I am going to enjoy tonight.” In fine dining, it’s not all about the food, it’s about the entire sensory experience. 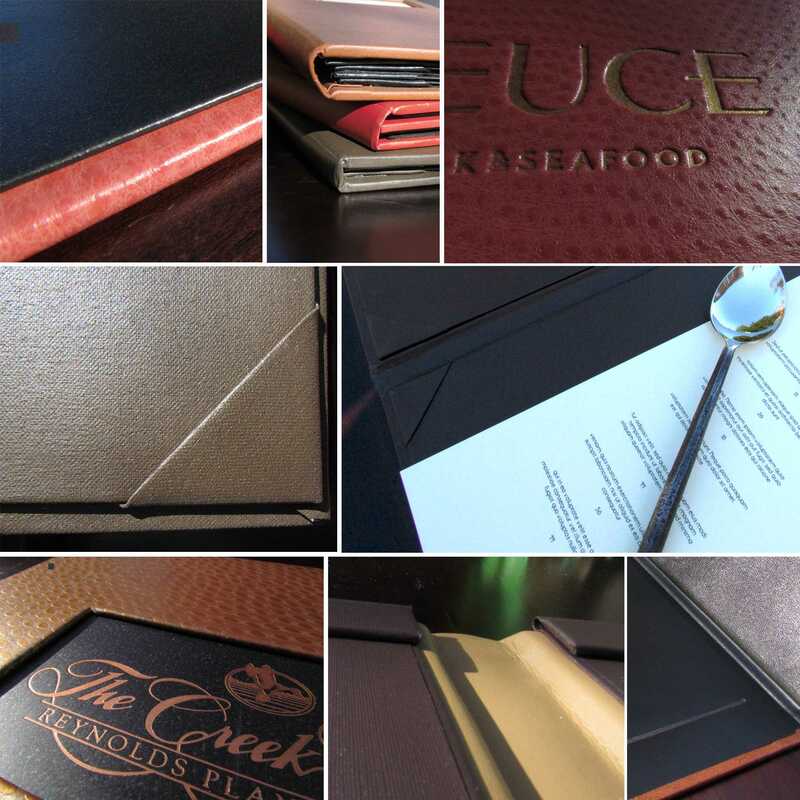 Our custom designed leather menu covers provide a literal touch and feel to the experience. Options galore, oh my! Yes, we are happy to say, “if you can think it, we can make it.” We are also happy to say, “while it’s possible, let us help you fine-tune your vision.” Like Flemings and hundreds of other establishments that cater to an upscale clientele, we work with each client to develop a custom solution that is perfect for their need. We work with designers, engineers, and manufacturers to ensure the finished product meets the desired outcome. We’ll show you examples and allow you to touch and hold the piece to see how much it will weigh, how thin or thick it will be, what will the leather look like, how will the logo appear, how will the cover showcase menu items, and many other options. We will guide you through every step. Your confidence in us and your peace of mind about your choices is our ultimate goal. Leather menu items, while custom, are also available in quantities as small as 25. Each piece is handmade in the U.S. by craftsmen with decades of experience in working with leather and other materials. Leather menus are made from the same durable material as leather car seats and leather shoes, so they are made to last and take punishment. Liquid and food repellant, easy to store, easy to clean, and easy to exchange menu pages, leather menu covers provide an elegant touch that will surely impress the most elite of clientele.